Move It! Groove It! Shake It! Kick It! 60 Minutes Every Day! Kids love to move! Give them a ball and they want to kick it. Give them a pool and they'll do a cannon ball. Play music and they'll want to dance. But, did you know that moving was good for us? In fact, kids need to actively move for 60 minutes every day to keep their bodies healthy. That's right 60 minutes every single day. It's one power hour that makes kids feel great. 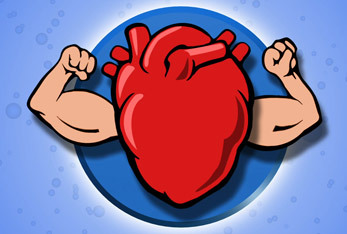 Exercising helps keep our heart, muscles and bones strong and flexible. Aerobic exercises, like running, jumping rope and swimming, may make kids tired in the short term, but if they keep with it they'll increase their stamina. They'll notice, over time, that they are able to play longer without getting as tired. Other exercises increase your flexibility, like yoga, ballet and gymnastic. Stretching your muscles keeps them strong and pliable, and less prone to injury. Exercise also activates the immune system, helping us stay well and feeling good. Our brains like it too. Exercise increases the oxygen to our brain making us all think clearer and feel better. Exercising can also put you in a better mood? When you exercise your brain releases chemicals, called endorphins, that makes you feel happier. Move It! Groove It! Shake It! Kick It! 60 Minutes Every Day. Swimming. It's fun and good for you! FIT KIDS 3 How do I do 60 minutes?